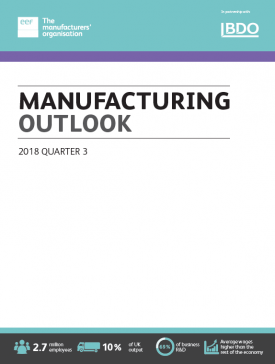 Manufacturing output and new order intake held firm over the past quarter with companies expecting this positive picture to be sustained into the final months of this year, according to a major survey published today by EEF, the manufacturers’ organisation, and accountancy and business advisory firm BDO LLP. Continued growth in the global economy continues to provide the backdrop for another quarter of positive survey readings from Britain’s manufacturers. Adding to this solid demand environment is the pick-up in domestic construction activity, providing a modest boost to domestic new orders. These factors have supported buoyant output balances in the past three months – marking the eighth consecutive quarter where a net balance of companies has reported expanding production levels, a trend which is predicted to continue to the end of the 2018. The survey also points to some recovery in profit margins, which is contributing to another quarter of increased recruitment and a revival in investment intentions. While these headline results are positive, it is important to drill down into the fortunes of different manufacturing sub-sectors. 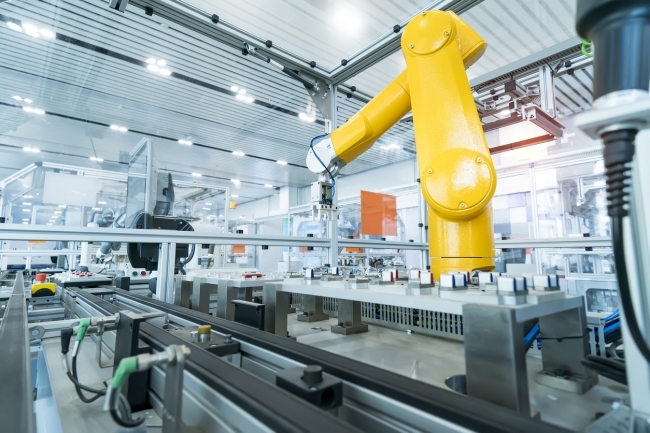 Strong global investment trends mean boom time for the UK’s electronics manufacturers and emerging capacity constraints put this sector firmly in the driving seat for increased investment. In contrast, sectors in the automotive supply chain are looking at a weaker order intake and more subdued investment plans. Looking ahead, confidence about firm level prospects is proving to be more durable than might have been expected, but the threat of escalating trade tensions and heightened concerns about a Brexit outcome that fails to deliver frictionless trade could quickly make trading conditions more difficult. Moreover, with the recovery in investment intentions unevenly spread across manufacturing sectors, we are cautious about the sector closing the productivity gap with competitors. 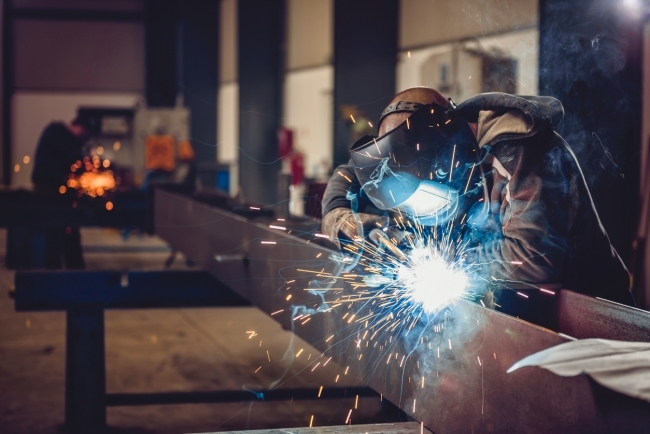 EEF says that their central expectations are that manufacturing growth is still on the cards this year and next, but risks to that outlook are increasingly present. Tom Lawton, Partner and Head, BDO Manufacturing, added: “Despite ongoing uncertainty, UK manufacturers continue to demonstrate resilience, and some confidence in at least the short term future – driven by increasing global demand, particularly from Europe. Coupled with a recovery in profit margins, this continued optimism in terms of output and orders has fuelled a pick-up in investment and recruitment. According to the survey, output and orders balances edged higher in the past three months (both at +27% from +26% and +23% respectively) making 2018 Q3 the eighth consecutive quarter of positive responses on these indicators. Both headline balances were broadly in line with last quarter’s expectations. The long-standing gap between export and domestic orders remained in place this quarter, despite the UK orders’ balance recovering to +14% (from +9%). At +24% the export balance was stronger than predicted last quarter (+19%). Europe remains the market most cited as a source of positive demand, with 62% of manufacturers citing buoyant demand conditions. While output and orders balances were largely positive across all sectors, electronics and basic metals stand out as the most upbeat about production levels in the past three months. Electronics companies also cite a broad based improvement in demand from multiple export markets, including Europe, North America and Asia. Mechanical equipment and rubber and plastics have, however, seen output balances come off the boil over the quarter. The former coming off a strong period of investment driven growth and the latter feeling the effects of a slowdown in automotive. The outlook for firms in the final months of this year looks stable with output (+29%) and orders expectations (+25%) remaining firm. This is resulting in continued recruitment intentions of +18% in the next three months (+21% in the past three months). There has also been a pick-up in investment intentions (+20% from +10%), driven to a large extent by capacity constraints in sectors such as electronics. In light of the weakness in official manufacturing statistics at the start of the year, EEF has made a downgrade to its manufacturing forecasts. It is now forecasting manufacturing growth of 0.9% in 2018 and 0.5% in 2019 (1.9% and 0.5% respectively from Q2). Forecasts for GDP growth this year and next are unchanged at 1.2% and 1.3%.